KW: You mentioned that the exhibit atmosphere was casual but that was the effect that you wanted… Why so? Explain this more if you can. Tania: As many artists know, it is very difficult to find exhibition space in New York. I was invited to show at Panda, and though it is not a traditional gallery and is very casual, you never know who may show up and see your work. Luckily, many people showed up, and word spread around quite quickly–and more people showed up! In the end, most of the show sold. The casual atmosphere was also less intimidating, allowing the viewers to approach me easily and ask about the work. KW: Tell us more about this collection of paintings. What was your inspiration? What did the collection come to mean to you? Tania: This collection is very important to me because it gave me back my belief in myself, in what I am able to express. I had gone through a little crisis period, where I was unsure of my work. I suddenly picked up a wood panel I had and began painting, and it all flowed quickly and easily. I suddenly found my medium, it was like I woke up from a long sleep. I concentrated on the expression of the figures, trying to convey as much emotion as I could in a small space and with limited environment. The wood helped create an environment of it’s own, allowing me to concentrate on the feelings I wanted to express. KW: Did the collection end the way you originally planned? What changed along the way? Was it an organic process? Tania: It was a very organic process. It began with the wood paintings, and I added drawings and larger canvas paintings that helped continue the romantic, melancholic mood. Most of my work carries this feeling, so that was not difficult. But those paintings set the tone, and that was the original plan. KW: You seemed to paint the same girl in different ways… Was it the same girl? Or different girls? What is her story? Tania: The girl seems the same because she is the vehicle of my own emotions. People keep mentioning they see my eyes in those paintings. I suppose that is what makes the girls similar, though it is not the direct intention. I paint directly without sketching first, so whatever I am feeling is what ends up on the “page”. They are characters that develop as I go along. I never know exactly what they will look like. KW: How long did you work on this collection? 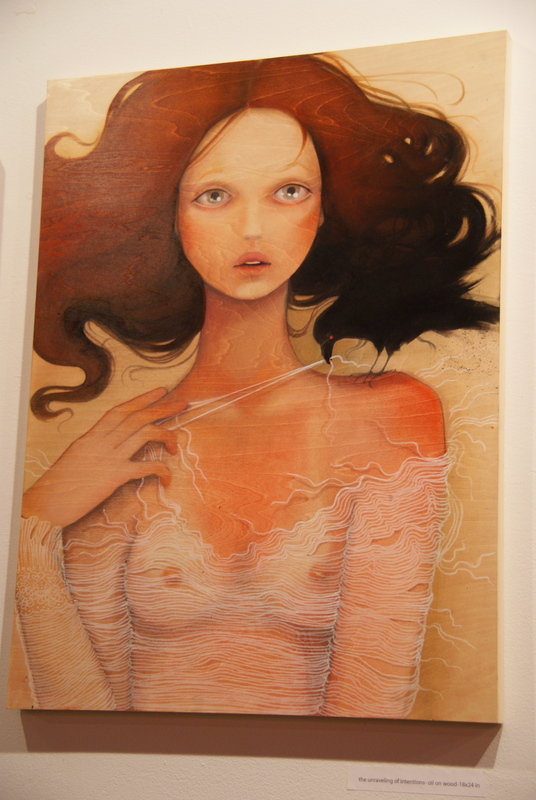 Tania: Most of the work is from 2011. So I’ve been working hard since January of 2011! KW: What is your next step? Any plans for a new collection? or expanding on this collection? Tania: I am expanding this collection. The reaction from people was so strong, that it has given me a push to continue. The next exhibit should be at the Lyle O Reitzel Gallery in the Dominican Republic, this Fall. I will happily continue with the paintings on wood, and some larger canvas paintings as well. I’ll explore every side of female emotion, until nothing is left! (impossible–thankfully). KW: Anything else you would like to share about your work? Tania: Though most of the paintings are my own characters, I do have “Muses”, and they filter through to the end result, hidden in the painting. I rarely let someone know they are my muse. It is a secret. KW: What do you think of TheKatswalk? Tania: I think it’s fantastic! A fresh, young look at what is moving and shaking, seen from the eyes of someone that loves the scene. A fresh point of view of the new and up-and-coming too! 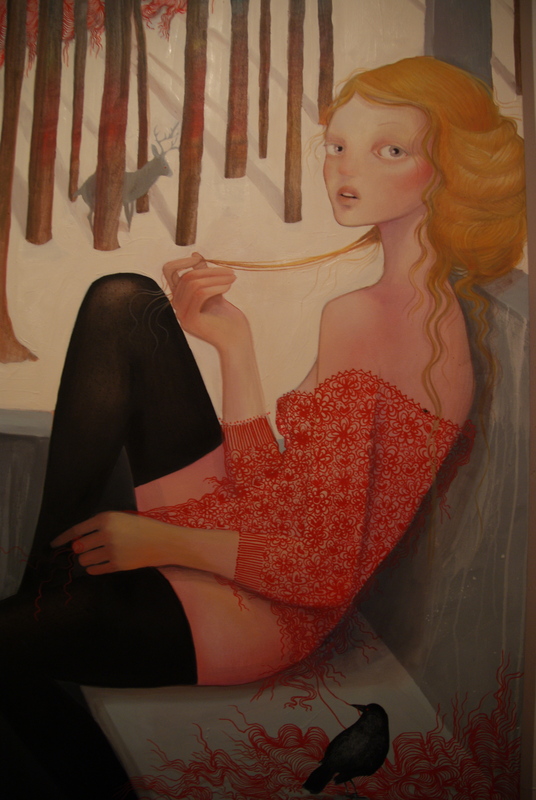 For more information on Tania Marmolejo, visit her website at http://www.taniamarmolejo.com.